You might think that hiking the Appalachian Trail is only for those who possess high levels of athletic prowess and boundless amounts of energy. Sure, walking over 2000 miles is no easy feat. It’s draining and tedious. However, a strong mental attitude will get you further than a gym-toned physique. I have never played team sports in my life, and I have no idea how to use the majority of the machines at the gym. Training for my thru-hike consisted of carrying a backpack stuffed with fifteen pounds of textbooks across my college campus every day for three years. The only time I broke a sweat pre-hike was while trying to decipher symbolism in 18th Century British Literature. If I can thru-hike the Appalachian Trail, you can too. This is why the A.T. is for everyone, even the physically inept and the lazy. 1. You get to eat a lot of food. Eating good food is one of the most rewarding activities you can do. Sadly, we typically have to be careful not to eat too much for fear of gaining weight. Imagine if you could eat all the food you wanted, as much as 5000 calories a day, and still lose weight. Sign me up (again). 2. The only thing you have to do is walk. You know all those annoying things you hate to do, but you do them because it’s part of being a functioning member of society? You don’t have to do them anymore! No more replying to emails, running the dishwasher, sitting in traffic, or feeding the neighbor’s cat while she’s on vacation (make sure someone else is feeding the cat before you leave though). The only thing you have to do is get up every morning and walk. 3. You don’t have to go to work. OK, this could fall under number two, but I think it’s so exciting it deserves its own category. Anyone who has ever worked a low-wage, zero satisfaction job that you were over-qualified for will understand how not having a job could be the best thing ever. So, you don’t have an income for six months. No job + no apartment + very little money = no worries. 4. You don’t have to be in good shape to hike. While it’s always a good idea to try to get in shape before departing for your thru-hike, if you fail to do so you won’t be the only one. It’s doesn’t matter if you are overweight, you smoke too many cigarettes, or your legs feel like jelly after the first day (you may even be all of the above). As long as you keep putting one foot in front of the other, you’ll drop some pounds and tone your muscles. 5. You get to sleep a lot. I’m the type of person who requires at least nine hours of sleep to feel happy and refreshed the next day. Waking up in the wee hours of the morning might not sound appealing to my fellow bed bugs, but fear not, you might actually get the best sleep of your life on the A.T. Waking up at seven A.M. is hard. But if you collapse, exhausted from hiking, into your sleeping bag at nine P.M. the night before, you’ll get a full ten hours of sleep before you have to wake up in the morning. Maximize your comfort by bringing ear plugs and an inflatable sleeping pad. 6. You don’t have to spend any time on your appearance. Do you ever wake up in the morning, intending to shower and put on matching clothes, but due to the desire to sleep in or have an extra cup of coffee you reason with yourself, “I could probably just go out like this”? If this sounds like you, then welcome to the trail, my friend. You are home now. 7. You can complete the trail by hiking at a slow pace and taking plenty of zero days. Even if you only hike twelve or thirteen miles a day and you take 20-30 zero days, you’ll still complete your hike in about 200 days, which is a perfectly respectable amount of time. During the first month on the trail, a thirteen mile day might seem unfathomable. Before too long, it will just seem like a mild day of hiking. 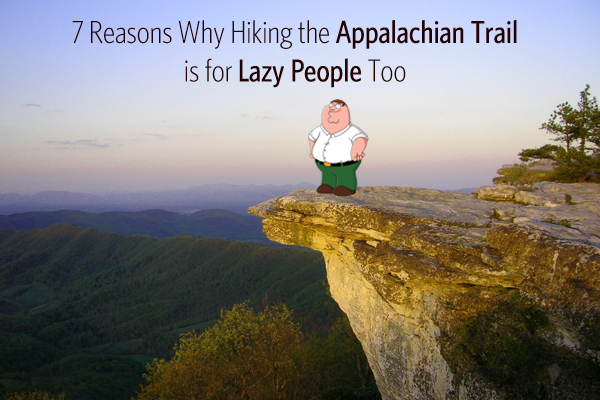 Don’t let being out of shape, lazy, and tired be the reason you don’t hike the Appalachian Trail. You can be all of those things and not only succeed, but thrive on the trail.